How can you avoid scraping shins deadlift pain? Some say that deadlift shin scrapes and bruises are an expected consequence of deadlifting. But the truth is that hurting your shins is a sign that you need to improve your deadlift form. Deadlifts are a fantastic way to get leaner, get stronger, transform your physique or become a better athlete. But, because the deadlift is so powerful, there is more risk deadlifting than taking a stroll. Improving your deadlift form is hard work, but the results are worth it because great deadlift form is how you prevent shin scrapes and worse. How would you stand if you were going to jump up as high as possible? You would not take a very narrow stance with your feet close together. And you would not take a very wide stance with your feet spread far apart. Your strongest position to jump as high as possible is with your feet hip width apart. Notice how far apart your feet are when you get ready to jump as high as you can. That is your jump stance. This position will give you the greatest amount of power to push the floor when you begin your deadlift motion. Imagine walking up to the bar, and standing in front of the bar in your jump stance. The deadlift is not a squat. In the squat, your hips go below parallel to your knees at the bottom of the squat. In the deadlift, you keep your hips higher, above your knees. If you attempt to deadlift out of a squat, your shins will be leaning forward past the bar. That is a great way to scrape your shins. You need to keep your shins out of the way of the bar. Ideally your shins will be almost perpendicular to the bar. When you deadlift, the bar will maintain contact with and glide over your shins. But how do you get down to the bar? The answer is to move your hips back as far as you can. This will cause your hands to drop down to your knees. Imagine it and try it. When your hands are at your knees, now lower yourself to the bar. Your hips will still be above your knees, as if in a half squat. Grip the bar, not too wide and not too narrow. The ideal grip is where your arms are just outside of your legs. Remember to keep your arms straight with no bend in the elbow. Never try to deadlift with your arms. Think as if you are carrying two suitcases at your side. You will carry them, with straight arms, using the strength of your lats and back. You stabilize the deadlift weight with your arms. Do not lift the weight with your arms, rather deadlift using your entire body. You are going to lift by first pushing the floor with your feet and then driving your hips forward. I will explain that a bit further on. Now, you are set up in front of the bar, in a jump stance, bar over the middle of your foot, hands just outside the legs. Line up the barbell over where you tie your shoelaces as a cue that you are mid-foot. Hips higher than your knees as if in a half squat. And your elbows are locked to ensure your arms are straight. Lifting your chest will automatically straighten your back. You must never deadlift with a round back. Only deadlift when your back is neutral and flat. At this point you are ready to deadlift. Your shoulder blades are straight over the bar. You are sitting back a bit as you will see in the video below. Your weight is evenly distributed on your feet, not on your toes. The following is perhaps the best tip I ever read about the deadlift. And I first heard it from Jeff Cavaliere. Start your deadlift motion by pushing against the floor from the middle of your feet. Just as you push on the leg press machine. Push the floor with your feet. Think of pushing the floor. As the barbell rises, you keep contact with your shins. You will feel the barbell gliding over your shins. Not banging against your shins. Your shins act as a guide, a track for the barbell to ascend. Watch Jeff illustrate this concept of deadlift as a leg press in his deadlift setup video. Another way of saying the same thing, but that might resonate with you. Think knee extension and not hip extension. If you initiate the deadlift with hip extension, you will try to pull the bar off the floor. You will use your arms and back and try to pull the weight up. Besides the danger to your back, you will scrape your shins because they are still not out of the way. The solution is to think knee extension. Knee extension is the leg press as described above. Instead of starting the deadlift with your hips, you start with your knees. Pushing the floor from the middle of your foot will move your shins out of the way. And will make it easier for you to deadlift. Think of how hard you push the floor to do pushups. You need to push the floor likewise to start your deadlift. Stop trying to lift the weight without pushing the floor first. As the barbell rises, think that you are deadlifting in a vertical line off the floor. You are not dragging the bar into your shins and pulling the bar back. You are lifting, deadlifting the weight in a vertical line. The vertical line is the shortest distance from your deadlift setup to standing upright with the weight. The next phase of the deadlift is to drive your hips. When the barbell reaches your knees, drive your hips forward. This way you will be using the power of your hips, back and lats to straighten up while holding the weight. Do not arch your back at the top of the deadlift. Stand straight for a moment and then lower. Move your hips back till the barbell reaches your knees. And then lower the barbell to the floor. Stop bouncing the barbell off the floor to use that momentum to get more reps. The deadlift is a lift of dead weight off of the floor. Not bouncing the barbell off the floor. When the weight gets heavy, bouncing the barbell is a wonderful way to get injured. Lower the barbell, reset, and deadlift as explained above. Stop wearing running shoes for deadlifting. This is the best way to distribute the weight throughout your foot. Flat soles reduces the distance between your feet and the floor, reducing the distance of your deadlift. Every millimeter reduction in how high you must deadlift the bar counts. Hard soles gives you better stability, which results in better barbell control, and deadlift form. Running shoes on the other hand have compressible soles which do not provide sufficient stability for deadlifting. Running shoes are for running, not deadlifting. Either get the right shoe or deadlift in socks. A lower price point to get started, Chuck Taylors are an affordable option to replace your running shoes for deadlifts. Of course, you can wear Chuck Taylors casually, for basketball or for squats and deadlifts as powerlifters discovered years ago. The Reebok Nano version 6.0 crossfit trainer shoe is another excellent option for deadlifting. With a flat hard sole and strong Kevlar canvas, the Reebok Nano will give you the stability necessary for handling heavy weights. As of today, Nike Metcon 4 are the shoes I use to squat and deadlift. The Nike Metcon 4 is popular with strength and crossfit training athletes. Among the best feature of the Nike Metcon 4 is the flywire built into the lacing system helps keep the foot secure and locked into place. Stability is critical. If you have any knee issues such as a torn or missing meniscus, you must make sure to have the most stable shoes possible for deadlifting. As soon as you start lifting weights, especially for squats and deadlifts, get out of those running shoes and into the most stable, hard sole deadlift appropriate shoes that you can afford. Ruining your knees is not the goal of deadlifting. Invest in a good pair of deadlift shoes, whether the Chuck Taylor All Stars or the Nike Metcon 4. Do not risk injury. There are many deadlift shoe options available and no excuses. Read this for more details on how to squat with proper form. 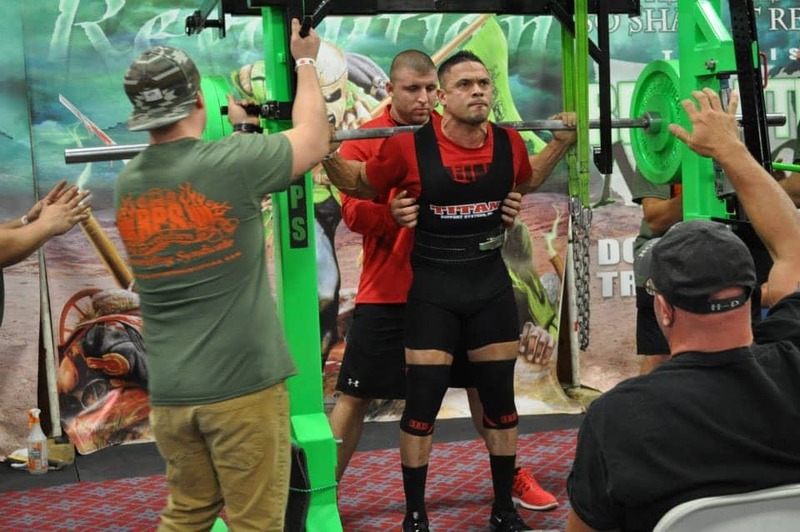 The current USAPL NJ state powerlifting Champion and the NPC Tri-State Bodybuilding Champion, Ray Padilla, does not have a meniscus in one of his knees. Ray Padilla’s advice – How to avoid scraping shins on deadlifts and other injuries? Get the Right Shoes! Follow Ray on Instagram @eps_training. Deadlift pants are not the best solution to prevent scraping your shins deadlifting. Fine-tuning your deadlift form is the best answer to prevent shin scrapes and bruises from deadlifting. If you do not perfect your deadlift form, even with long deadlift pants, you will still bang your shins up. However, deadlift pants are a good option to protect your shins as you hone your deadlift form. You cannot easily see the middle of your foot for the deadlift setup. And as you know, setting up the bar over the middle of your foot is critical to getting the maximum push off the floor. If you decide to compete in powerlifting, deadlift pants are not allowed in competition. So you better get used to deadlifting without the shin scraping protection of long pants in case you want to compete in a powerlifting meet someday. Relying on deadlift pants to protect your shins will not help you better your deadlift form. Nevertheless, using long deadlift pants are a smart way to start deadlifting or practice refining your deadlift form. You can easily see the middle of your foot for the deadlift setup. An effective cue to judge mid-foot is to set the bar directly over where you tie your shoe laces. If you decide to compete in powerlifting, deadlift socks are allowed in competition. deadlift socks do protect your shins and help you focus on improving your deadlift form. My favorite socks for deadlifting at this point are MOXY Performance Deadlift Socks. They last long, are comfortable and go over the knee. You can also use soccer socks for shin protection, but the advantage of Deadlift Socks like MOXY is that they have additional padding in the shin area for better shin safety. Another option to deadlift without scraping shins is to get deadlift shin guards. Even though deadlift shin guards are not permitted in powerlifting competitions, you have the same benefits of deadlift socks with added protection for your shins. In your next deadlift workout, use light bumper plates to practice perfect deadlift form. Bumper plates are the same size as standard 45 pound iron plates, but are available in weights as light as 10 pounds. As a result, bumper plates are an excellent tool to improve your deadlift form and prevent unnecessary injuries. Great deadlift form is how you prevent bruising your shins while deadlifting. Deadlifting every day you workout will help you work on your form. You can deadlift everyday you train, but you cannot go heavy every day. Daily heavy deadlifts will be too much for your central nervous system to handle. Here are 10 deadlift form rules to prevent lower back pain. Scraping your shins on the deadlift is very painful and can even result in bloody shins. Learning how to deadlift with great form is the best protection for your shins. As well as avoiding the risk of other injuries when deadlifting. Perfecting your deadlift form should be your goal, not how much weight you can deadlift. Even if you do not deadlift heavy, you still gain many health and fitness benefits from deadlifts. I lost 75 pounds in 6 months just from real food, squats, deadlifts and pushups. And believe me, at 61 years of age with a torn meniscus, I do not deadlift heavy. This post gives you 15 actionable tips to prevent hurting your shins on deadlifts. What are your best tips to prevent scraping shins deadlift pain? We did an interview with Strength Athlete Becci Holcomb. Becci sets records usually in our American Star socks. We will be featuring a Moxy Socks athlete every week. If you would like to be featured, send an inquiry to moxysocks@gmail.com or message us on instagram: @moxysocks. Here we have 15 Questions with Becci, asking her about being a strength athlete. Enjoy everyone! My name is Becci Holcomb. I am 27 years old. I am from Blanchester Ohio. I currently live in Marietta GA. I am a Doctor of Chiropractic Student at Life University in Marietta. I am a strength athlete, but I do like to play around with other sports and yoga. I am a powerlifter. I compete in the USA Powerlifting and International Powerlifting Federations. I have progressed a lot since I started almost 2 years ago. I couldn’t squat to depth and now I am one of the top ranked super heavy weights in the US. I am also in the world all time records for raw female super heavy weights. I hold the USA Powerlifting (USAPL) American record for the deadlift in the 90+ KG weight class with a pull of 507 pounds. I heard about Moxy Socks from Amazon. I did a search for lifting socks and Moxy Socks had some of the best ratings from people with larger calves. I gave them a shot and I’ve been hooked on Moxy Socks since then. They are the only socks I wear for lifting. My best lifts would be 475 pounds in the squat, 250 pounds in the bench press and 507 pounds in the deadlift. What’s your favorite part about being a strength athlete? I have two favorites. First would have to be the mental aspect of powerlifting. You have to be in the right mental place to be able to go out multiple times a week and lift heavy weight. My second favorite thing would have to be the self confidence that I have gained since I started powerlifting. I have always been bigger and chunkier. That along with a not so great childhood left me with very little self confidence. I couldn’t wear tank tops, cut-offs or bathing suits. Now I wear tank tops almost every training day, around school and I spend so much time at the pool in a bathing suit you’d think I would grow gills. I tend to follow my own diet. I eat fairly clean (almost Paleo). I eat a lot of lean meats, veggies and complex carbs. I love to cook and create meals. My favorite ones would have to be my “Captain America” ( American star) ones ( I actually have two pairs, the black with the pink and the white) and the Grumpy Cat Ho Ho No. The grumpy cat make people laugh every time they see me in them. My biggest motivation would have to be my family. I am the oldest of ten children. I want my siblings to know that they can do anything. You just have to get out there and try. I also want to be a role model for young girls. I want to show them that you can do anything. Your size, shape, etc doesn’t define you. I also want them to know that they too can be strong. I love all music. My Pandora has so many random stations. It really just depends on what kind of mood I’m in. If I’m studying, I’ll listen to Vitamin String Quartet. Hanging out around the house I’ll have classic rock on. I like way too many movies to have a favorite. As for favorite color, anything bright! I love neon colors. As funny as this may sound, I would love to have Disney socks. My next competition is in October at USA Powerlifitng Raw Nationals in Scranton PA. I like all three of the powerlifting lifts. Each one challenges you differently. Outside of powerlifting I would have to say my next favorite exercise is yoga. Its fun, challenging, good for recovery and mobility. I spend my free time studying, sleeping, hanging out with my friends, hanging out by the pool, netflixing, and creating and sewing custom shorts for my side business. My family, my team; PrettyStrong Powerlifting, Crossfit On the Square and my friends. We’re helping sponsor some events for the strong, awesome ladies at Ladies Lift Here. It’s a great organization and we LOVE what they’re about. #crossfit #fitness #deadlift #crossfitclothing #apparel #Repost from @ladieslifthere with @repostapp —- Our website is getting some serious loving over the next few days: new articles, new contests, new resources and new colors! We here at Moxy love people improving. We have been supplying fantastic socks for the Crossfit community, derby dolls, and all types of fitness gurus for the last few years. We are so enthusiastic to see people’s lives change dramatically, and recognize that everyone goes through struggles. We hope to make the best SOCKS ever, in the attempt you might enjoy your day,workout,month,life, etc. just a little bit more!! Today we are featuring a story submission from a Moxy fan, Sara. I hope her story and journey through Crossfit and life inspire you to be the best you can be!! About a year ago I went through a really hard breakup and was pretty much a mess. At that time in my life I was working part time as a nanny and was interning part time at a community mental health facility in my area doing children’s mental health and was a full time grad student. I was also about 150lbs and ate whatever I want (including a ton of sugar), I was just trying to survive. I’m 5’2, so that was pretty heavy for me and I definitely felt super uncomfortable in my own skin. I was also severely depressed. I started working out with a personal trainer friend to try to get into some kind of shape and help boost my mood. I wasn’t really seeing results and was still in a pretty bad head space. I kept it up for about 5 months until I moved to a different part of town. My new roommate had been doing CrossFit for a couple of years and he loved it. I didn’t really think it was for me. I was really intimidated by it and the people there. I decided to at least try the on-ramp class to see if I could even do it (I was pretty convinced I couldn’t) since it was a couple of blocks from my apartment. I completed the intro class and then ended up not going back for a month. My roommate hounded me and hounded me and FINALLY got me to go back. I started out going twice a week and then three times a week. It was insanely hard for me. After awhile I realized I was up to 5 days a week regularly. I’ve been at my box regularly now for 4 months. I’m down to 128lbs. I managed to kick my depression WITHOUT medications. I completed grad school and found a career in my field. The other members of my box are like family to me. I’ve made the transition with the help of my roommate to eating primarily Paleo. I am happy and confident. I have even completed my first hero wod (Murph) and today I completed my first rope climb to the top. It is amazing how different I feel about myself and my abilities since doing CrossFit. I have started conquering fears and testing my abilities in ways I never imagined. Hand stands, box jumps and rope climbs terrified me. Running a mile and double unders didn’t seem possible. But now I can do these things. Maybe not to perfection, but I know I can actually do them now. My co-workers see me as an athlete. That’s nothing I would have EVER considered myself as. I know my story isn’t some huge physical transformation, but it’s been a lot of small changes in almost every aspect of my life. I would have never thought that CrossFit would have such a large impact on my life or in so many ways. It’s become a part of me and my identity. We congratulate Sara on her AWESOME transformation and feeling good about life!!! Sara received a pack of socks for her submission and we thank her for sharing her important story! !